Micromax Launched New Smartphone Micromax Canvas Doodle 3. It has listed for sale online at Official website in Indian market. 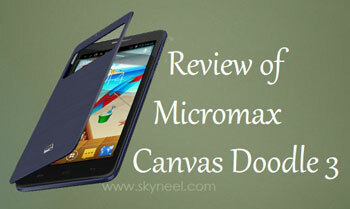 Micromax Canvas Doodle 3 price at Rs 8499 on the official website of the company. Micromax Canvas Doodle 3 runs on 4.2 Android Jelly Bean. Micromax Canvas Doodle 3 has Dual – core 1.3 GHz processor and 512MB RAM. There are lots of features in this handset of Micromax. Micromax Canvas Doodle 3 have much more and better features than Doodle 2. It has a stand-by time up to 260 hours, talk time up to 9 hours and it has a battery of 2500mAh with 6-inch display and 1.3 GHz dual core MediaTek processor with 512 MB RAM. It has resolution 480*854 pixel quality, and it runs on 4.2.2 Android Jelly bean. It has an auto focus rear camera of 5 MP and front camera of 0.3 MP. It has inbuilt 4GB storage capacity, which expandable upto 32 GB on a MicroSD card. In Micromax Canvas Doodle 3 there are lots of apps like Kingsoft office, Big-Flix, Opera-Mini, M-Live, M-Doodle and many popular games like the jumper, jelly, marbles and rope. Micromax Canvas Doodle 3 Powered by Dual-core 1.3 GHz processor With MT6572 Chipset. Canvas Doodle 3 has 512MB RAM With 4GB Rom and user can expanded up to 32GB. Canvas Doodle 3 comes with FWVGA 6.0-inch, 5-point multi-touch display with resolution 854×480 pixels. It has 5 MP Rear Camera with 2592 x 1944 pixels, LED flash, Auto-focus, and 0.3 front camera. Canvas Doodle 3 is a stylish phone. Canvas Doodle 3 runs on 4.2 Android Jelly Bean. The Smartphone has a compass, Accelerometer, proximity and Maps, Calendar, Google Search, Gmail, YouTube, Google Talk, Alarm, Calculator, Clock, and other Google sync apps. This is power pack with loaded lots of features and apps. Canvas Doodle 3 support 2G and 3G network and both SIM card slot suport GSM SIM. S Duos has Wi-Fi, Bluetooth, GPRS and EGPRS or EDGE, with 2500mAh Li-lon battery. 1. Canvas Doodle 3 has a bigger Screen Size. 1. Canvas Doodle 3 has only 0.3 MP Front camera. 2. Canvas Doodle 3 has Low Ram. 3. Canvas Doodle 3 doesn’t have a Compass.